White Suffolk-Merino cross wool in top form at the boutique mill, Paddock to Ply. WHITE Suffolk-Merino cross wool has proven to be a hit with one of Australia’s few fine worsted spinning mills, Paddock to Ply at Cooroy in Queensland. 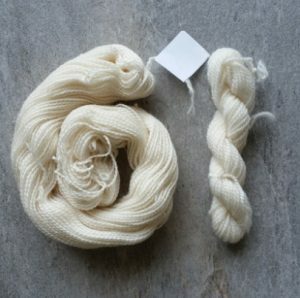 The wool from a traditionally terminal prime lamb cross, is described by mill owner Suzette Sayer as the “undiscovered wool for hand knitting”. 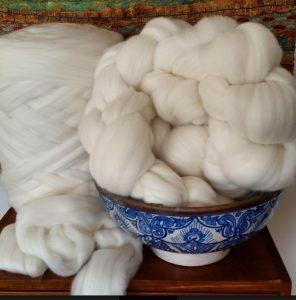 Ms Sayer sourced a 180kg bale of White Suffolk-Merino cross wool from Warooka Station, Victoria, with the aim of turning it into worsted spun yarn. She described the White Suffolk-Merino cross as an “often overlooked wool” but one which takes dye well, is versatile and soft yet durable. “The fleece is springy, has great elasticity and strength. “It is perfect for hard-wearing items like socks and everyday outer wear,” Ms Sayer said. The 26-micron wool was sourced through Fox & Lillie Rural and processed through the combing machine at Goldfields Mohair Farm, Bendigo, before being spun at Paddock to Ply at Cooroy, north of Brisbane. Samples of two-ply knitting yarn were produced for lace knitting, weaving and machine knitting into jumpers. She believes Australia should follow the success of the British promotional campaign around single breed yarns. “All you hear about is Merino, Merino, Merino, but we have lots of other sheep in Australia – ‘wools ain’t wools’ and not everything will spin up the way you hope it will,” Ms Sayer said. “They are all different and the machinery can’t cope with varying lengths, so the grower needs to be educated on specific lengths if they want to spin their wool for the worsted process. “I require staple lengths of 55-75mm – lengths of the machinery can only be varied so much,” she said. Paddock to Ply was established by Suzette four years ago to provide processing and production for 100 percent Australian-sourced natural fibres. These fibres are manufactured into luxury, limited edition, fine spun yarns for hand and machine knitting. The Paddock to Ply mill can process up to 20 tonnes of raw fibre, and was inspired by the need to address the lack of milling resources in Australia. Just 0.03 per cent of the nation’s wool is processed within the country, making it difficult to buy 100pc Australian-grown, scoured, processed and spun natural fibre yarns. “The few wool processing companies in existence, Paddock to Ply included, are trying to recreate an industry in Australia that has simply been devastated,” Ms Sawyer said. “It has taken many phone calls to find three people experienced in the industry as mentors – one actually works in China and a second in South Australia, so they are very rare and hard to get hold of,” she said. “With their help, they were able to tell me what size mill I needed to make a viable living. Possessing a background in textiles, Suzette began her journey after failing to source 100pc Australian made wool while planning to open a yarn shop. “The more I researched it, the more I realized what had happened to the industry and how we didn’t have a 100pc Australian product,” she said. “It was a learning curve as I had to establish if I just process for people or have a range of product with a background story designers can buy,” Ms Sayer said. Paddock to Ply can spin as little as 200kg of raw fleece or a minimum of 20kg of combed top (sampling requires a minimum of 4kg of combed top). The wool is first scoured at one of three plants in Victoria that specialises in small lots, followed by processing into comb tops before landing at Paddock to Ply. Dyeing is carried out by the nation’s last commercial dyeing plant at Geelong. “I’m happy to give people information as there are so few mills in Australia,” she said. “The knitwear manufacturers and designers would love a 100pc Australian product, but cannot get it,” Suzette said. “Combing is quite harsh and will break the fibres so the tensile strength is really important,” she said. “One bale I had was full of vegetable matter so over 50pc of it was lost in pre-processing and that makes the manufacturing process really expensive. “The grower needs to think about vegetable matter, shearing quality, clip preparation, skirting more or looking at weed control on the farm – if you want a top quality fleece you have to go the extra mile,” Suzette said. “In a typical bale, I’m looking at short ends and when it is washed, 15”20 per cent is lost in dirt and grease alone. “Organic, biodynamic and ethical wool is in demand – they are all aware of the mulesing issue,” she said.